Much as I welcome having Lord King's attempts to set the record straight on fractional reserve banking, I regret that in so doing he also twists the record somewhat in his attempts to straighten it. He is wrong, first of all, to treat the position taken by Murphy and his fellow Rothbardian's as representative of beliefs held by American libertarians generally, so as to then characterize the latter as "a lame cult of losers." There are plenty of libertarians who don;t subscribe to the Murphy-Rothbard position, including many who have criticized it on precisely the same grounds as Lord King himself does. Concerning Canada and Scotland, Lord King commits a very primitive error. He points to the few respects in which those systems departed from pristine free banking, and the occasional problems encountered in them, and then declares on that basis that claims to the effect that free banking systems tended to be stable are false. That procedure makes no sense, because what matters is a comparison of the systems in question to more heavily regulated systems. The question is, were less regulated systems more stable than their more heavily regulated counterparts. Was Scottish banking more stable than English? Was Canadian banking more stable than banking in the U.S.? Anyone who would answer "no" to either question has got a heavy burden to carry, for the superior stability of the more free systems was notorious to contemporaries. One need only read old newspapers to find many testimonials. As for government interventions, these, two, were relatively unimportant. Yes, Canadian banks couldn't lend on real estate; but neither, in the 19th century, could U.S. national banks. Yet O.M.W. Sprague could author a thick volume entitled "Crises under the National Banking System," whereas one would be hard pressed to fill a pamphlet on the topic of Canadian banking crises" during that same period. 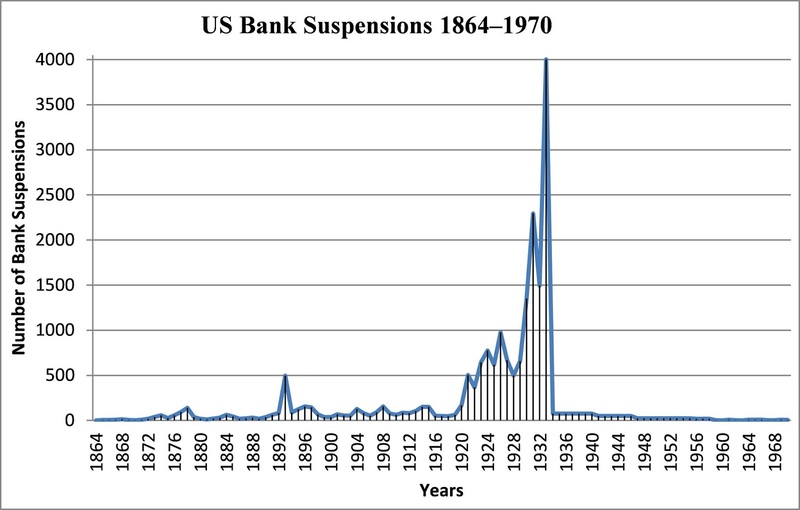 (There were bank failures, to be sure; but no major crises.) There was a minor crisis in 1907, related to the fact that a long-standing aggregate Canadian note issue ceiling had become binding; the law allowing Canadian banks to secure unbacked Dominion notes was designed to allow them to meet currency demands despite that ceiling--the same end might have been accomplished by relaxing the requirement. So one intervention by gov't made up for a problem related to a pre-existing legal restriction. Does that make for an argument against freedom in banking? I can't see how. Finally, the Australian crisis of 1893. Well,the free bankers haven't ignored it. It's discussed in Dowd's 1992 volume, The Theory of Free Banking, and in my JFSR article on "Bank Lending 'Manias" in Theory and History." I refer LK and his readers to these works for our assessment of the implications of that episode. But for the sake of argument, let's allow that it constitutes a black mark on the record of free banking systems. So what? Again, the question is how well free banking systems performed in comparison with less free systems. The history of the latter systems is littered with more major crises than one can count. So what sense does it make to point to a single black mark in the record of free banking, and then conclude, with a flourish, that it was not after all superior to actual alternatives? No sense at all, I submit. I have myself compared, using secondary sources, the incidence of crises in less and more free banking systems in my Critical Review essay, "Are Banking Crises Free Market Phenomena?" I'd welcome JK's attempt to improve upon that comparison; still I very much doubt that by doing so he will reach a different conclusion from the one I reached in my original attempt. I'm afraid, LK, that your addendum hardly establishes what you wish to establish. For one thing, Dowd, White, and I have always been careful to note that the U.S. _never_ had anything like "free banking" in our sense of that term--that is, banking that's largely unregulated. Indeed, we've all written at length about the many interventions in both the antebellum state banking systems and the National Banking system that prevailed between the Civil War and the founding of the Fed. 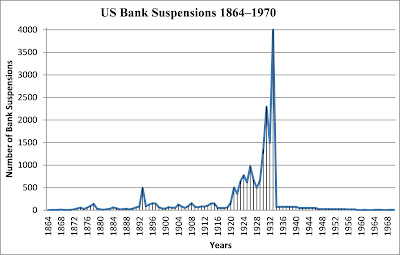 (That the period between 1914 and 1945 in the U.S., which is where the mass of bank failures shown in your little chart occur, doesn't qualify as one of unregulated banking ought to go without saying.) In short, if you want to make the point that U.S. banking since 1945 has exhibited greater stability than any free banking system of the past, you have at least to choose from among one of those past free banking systems. Comparing the heavily regulated post-1945 U.S. system with the also heavily (but very differently) regulated pre-1914, or pre-1945, system tells nothing about the relative merits of unregulated banking. Second, it makes no sense to compare one sort of system from, say, 1850-1900, with another from a different era. Changes in communications and such ought to make for a large difference even if the regulatory regime itself didn't change much. So the best info. comes from comparing contemporary systems that had much in common save fro the regulatory regimes in place. That's why we stress so much the comparisons of Canada vs. the U.S. ca. 1870-1014 (or 1933) and Scotland vs. England ca. 1775-1845. Finally, although the U.S. monetary system post-1945 was in most respects far between than the system before 1945, that's almost entirely due to the disastrous interwar years. If one compares the records for the 1870-1914 and post-1945 periods, it is not so easy to sustain the argument that the latter marked a decisive improvement over the former, even despite the many changes apart from bank regulation--including a far larger role for countercyclical fiscal policy--that should have made the latter period more stable overall. For details see my J. Macro. paper w/ Larry White and Bill Lastrapes,"Has the Fed Been a Failure?" For "The Theory of Free Banking" in my first comment please read "The Experience of Free Banking." There's an entire chapter on Australia there.